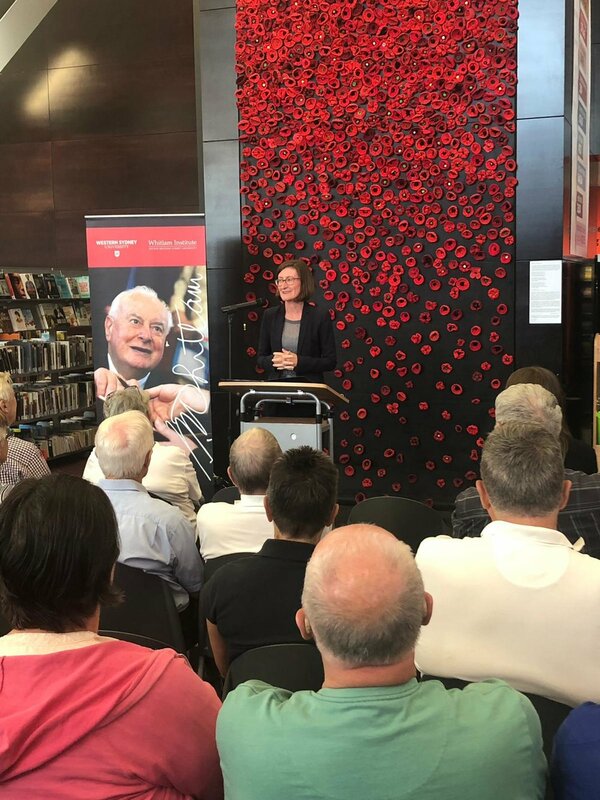 On 6 March 2019, Director Leanne Smith was the guest of Albury City Council, addressing a crowd of Albury locals at the LibraryMuseum on the legacy of the Whitlam Government and Gough’s special relationship with the region. The visit coincides with the showing of Whitlam Institute exhibition The Way of the Reformer: Gough Whitlam in His Century at the Albury Library Museum, on display until 24 March 2019. Good evening distinguished guests ladies and gentleman. It is a great privilege to be here in Albury to deliver this address - Legacy of a Leader - Whitlam’s Reforms and Modern Australia. I am Leanne Smith Director of the Whitlam Institute; a public policy Institute commemorating one of Australia’s most respected Prime Ministers - Gough Whitlam. May I acknowledge the Wiradjuri people as the traditional custodians of the land where we are meeting today and pay my respects to Elders past, present, and future and to any Aboriginal and Torres Strait Islander people who are with us here today. Tonight I want to share with those of you who might be too young to remember, some of the highlights of the Whitlam reform program from 1972 - 1975 and why they are of continuing importance and relevance to Australia. I want to focus on urban policy and why Gough Whitlam, thought Albury-Wodonga and other regional centres like it, were so important to the future of Australia. In the context of our touring exhibition, I want to share with you more broadly some insights into the early life of Gough Whitlam and what shaped and influenced him as a man, such that he would become one of the great reformers in Australia’s history. And I also want to let you know a bit about the work of the Whitlam Institute, what we are trying to achieve and how you perhaps could get involved and play a role. The Duumvirate was just the beginning, as Bramston opined “never before or since has such dynamism and energy been injected into the national government and nor has the apparatus of government been pushed and pulled into action with breakneck speed and with such far-reaching significance” (Bramston 2013). The following year the Whitlam Government passed 203 pieces of legislation, vastly exceeding the output of the previous parliament in 1972 (139 bills passed). • Introducing legislation to create The Administrative Appeals Tribunal, a world first, allowing the citizenry to challenge administrative decisions made on their behalf by government, in matters such as taxation. · not to mention foreign policy achievements such as establishing Australia as a middle power, leading the world in diplomatic and trade relations with the People's Republic of China and granting independence to PNG. I was at Sydney airport this morning, trailing from the terminal to a bus to get the flight, there was no attendant and no sign so as I was getting onto the shuttle bus I asked a fellow passenger, is this the shuttle for the Albury flight? He answered, ‘Yes. But not Wodonga’. I haven’t been here for 20 years, but I remembered that twin city rivalry. Of particular interest to the good people of Albury and Wodonga would be another issue that Whitlam considered to be of critical importance to Australia – the future of our cities. Gough Whitlam's outlook on the planning and development of Australia's cities was shaped by his experience of having grown up in Canberra – the only Australian city whose development was guided by a single level of government. This instilled in him a firm belief in the capacity of the federal government to provide the resources and organising authority to resolve the urban problems that affected the living standards and opportunities of Australians most severely. Later raising a family in Sydney's rapidly growing western suburbs gave Whitlam direct experience of the consequences of poor investment in the infrastructure and services people needed in these new residential areas. “There was a mutual feeling, shared by all concerned that this agreement and; the cooperation it engendered was a symbolic first step towards a new and more human pattern of urban living in Australia” (Hon Gough Whitlam 1973). So, Whitlam had his agreement and the great task of planning the development this new inland city, along with many other associated urban development projects around Australia, was to commence. Whitlam considered that where a person lived was central to what he termed “…a citizens real standard of living’…”which included access to employment opportunities, access to resources for recreation and culture, and critically for Whitlam, the ability of the citizenry to participate in the discussions that affect the way people live. That last point is noteworthy, because Whitlam and his government were not interested in governing for its own sake, or to corral power into the hands of a few well-connected and privileged people (in the 70s almost always men). The Whitlam government wanted to devolve power, to democratise. This Herculean task of urban renewal, reform and building fell largely to the new Minister for Urban and Regional Development, Tom Uren. The new Minister grew up in working-class Balmain trained to be a boxer, and like Whitlam, served his country in WWII - suffering the brutality of the Burma-Thai Railway as a prisoner of war. His war experience shaped his outlook on life, he opposed militarism and believed in peaceful coexistence. He was also keenly interested in housing and community (Uren, Full Interview transcript 1996). “this is the first time in history of our nation, apart from Canberra, that the Australian government has stepped into the area of new city development by direct budgetary allocations” (Uren, New Cities Program Ministerial Statement 1973). Uren spoke of Albury-Wodonga as representing the government’s major priority in terms of regional and urban growth, committing a total of $9 million (85 million in 2018 dollars) to support a new city complex. The government also committed resources and funding for regional and urban growth development in a number of other geographic locations including Holsworthy, Menai, Campbelltown, Camden, Gosford-Wyong, Bathurst, Orange, Geelong, Southeast Melbourne, the Mornington Peninsula, Townsville, Gladstone, Rockhampton and other areas. All states were allocated funding from the program, which ostensibly included two policy imperatives; firstly, a concentration on regional growth centres which comprise new city development (including Albury-Wodonga) at a substantial distance from existing city development; and secondly a “…concentration on system cities which are intended as substantially self-contained cities on the fringes of existing metropolitan areas” (Uren, New Cities Program Ministerial Statement 1973). While the initial priority for the program, particularly as it related to Albury Wodonga, involved land acquisition, a proportion of funds were also set aside for selected public works - for sewerage and water supply, social facilities such as improved public transport, hospital facilities and childminding centres. “… Let’s not imagine that this is an Australian government project exclusively, far from it. Its success depends on continued cooperation between the Australian government and the states - the three governments are equal partners” (G. Whitlam 1973). I was particularly pleased to see that provision has been made for a consultative council to provide a vehicle for public participation in the project. Over the past nine months the interim consultative committee, made up of representatives of local government and community interests, has played a vital and contributing role in the development so far. This Government cannot solve the problems of 23 years overnight. These are still early days in the life of this Government. Yet our achievements in the fields of urban and regional development so far show our determination, not just to overcome past mistakes, but to create new opportunities for Australians to live in urban areas that are comprehensively and attractively planned. Ideally, the project was designed to provide a better quality of life for people with cheaper housing, jobs near homes, education, amenities and recreational facilities; whilst also involving people in the decision-making within their communities. The project was to acquire the necessary land such that appropriate development of community infrastructure could occur to accommodate 300,000 people by the turn of the century. All governments involved, state and Commonwealth were keen to develop a significant inland city. In 1975, $400 million was allocated towards the development of the Albury-Wodonga growth centre. As you all know better than anyone, while the population target was never met, the corporation acquired a significant amount of land and developed a substantial amount of residential and industrial property, as the Minister for Finance noted in a press release announcing the windup of the corporation in 2014, “Following its establishment in 1974 the Albury-Wodonga Development Corporation held 24,079 hectares. It has now ceased its development activities and at 30 October 2014 held 986 hectares of land and 81 residential and industrial lots” (Corman 2014). However, there were significant population increases. “In the period from 1971 to 1976 Aubrey Wodonga had grown by a very respectable 8566, from a population of 54,851 in 1971 to 63,407 in 1976. This was the largest absolute increase of any country Centre in New South Wales and Victoria” (Pennay 2005). It’s clear that the plans for Albury Wodonga and other regional centres involved in Whitlam’s ambitious cities program were one part of the Whitlam legacy cut short by the dismissal of his government in 1975 and the Fraser Government’s decision not to pursue the decentralisation policies. Whitlam had always envisaged that Albury-Wodonga would have its own university, for example. However even after the dismissal, Whitlam maintained a close connection with Albury-Wodonga, including launching the regional Art foundation here in 1989, speaking at University graduation ceremonies and at an exhibition opening at Albury Regional Art Gallery in 2004. He is honoured in Wodonga in the name of a very small street in Federation Park. I don’t expect with quite the grandeur he had once expected, given stories about the quip he once made that Albury Wodonga should be named ‘Whitlamabad’! I would be very interested to hear from you about what you thought of this decentralisation experiment, what it has meant for the communities of Albury-Wodonga, and what might have been had the investment continued? The exhibition has travelled great distances to be in Albury and we are so glad to bring it here, given the history I have just described. Curated by Guy Betts, the exhibition debuted at the Whitlam Institute, within Western Sydney University in June 2016 to mark the centenary of Gough Whitlam’s birth. The exhibition then travelled to the National Archives (2017) and Broken Hill before coming to Albury. Next stop - Grafton later this year. While there are only around 20 items at the exhibition, there are some quite remarkable and unique pieces such as a poem written by Mr Whitlam entitled Youth and Tradition. There is his grammar school badge, his diaries, proposals for Western Sydney, health policy, his ALP membership card - among other items. What you may find particularly interesting, is a letter by a young Whitlam in 1938 to his mother and father while studying at university. He talks about usual mundanities, such as: having to borrow for lecture fees till his scholarship money arrives; and spending 25 shillings on a new hat, he explains that this was a necessary purchase as his old hat was five years old and he needed something more stylish, for going into law lectures. The letter does however unearth something more interesting about twists of fate. In the letter he bemoans not having done better in his Greek and Latin examinations. Although his lecturer suggested that he showed signs of literary appreciation, Whitlam had apparently already decided to reconsider his academic aspirations. Instead of going into academia, Whitlam said that he “was going on to law, as I thought I did not have sufficient application to do really well in the classics.” His lecturer agreed, and so Gough Whitlam went on to study the law, that occupation so ideally suited to politics and so clearly underpinning his own politics. Who knows what might have happened had Gough Whitlam done better in those latin and Greek exams and gone on to become a professor in the classics instead of Prime Minister. 13-year-old Gough Whitlam was as astonished by the unrestrained jubilation of the members as he was by the determined sobriety of their leader Jim Scullin, the lone teetotaller among them. Although nearly 80 years had passed since the event took place it remained sharp in Gough Whitlam’s memory recalling a childhood spent in unusual familiarity with political life in the new national capital of Canberra, from the very first years of its creation. So clearly, Gough Whitlam did not have a run-of-the-mill upbringing. His father, Fred Whitlam, was a significant figure, Deputy Crown Solicitor and later Crown Solicitor, who had accompanied Dr HV Evatt to the crucial 1946 Paris peace conference that oversaw the formation of the United Nations (Hocking 2008). The worldview that Gough Whitlam took to the Parliament of Australia was imbued by this most unusual environment in which he grew up. He cannot help to have been influenced and impressed by the dramatic and important events that occurred around him. He himself, and his government, were to play a decisive role in changing the way Australia related to the rest of the world, not the least being an early recognition of the People’s Republic of China. There were (Aboriginal people) there but they were very fortunate. They’d only had missions for no more than 10 years and that meant the (Aboriginal people) at Gove had their dignity and identity unharmed. Because missionaries taught (Aboriginal people) that they were godless, they were heathens, made them feel inferior. That applied to whoever it was, Catholic or Anglican or Methodist or Presbyterian missions. They destroyed (Aboriginal people’s) self-respect. Now these are strong words. But I knew it, I saw it. The RDA proved critical in later years in striking down Queensland’s discriminatory policy against land transfers (Koowarta v Bjelke-Petersen) and in buttressing fragile native title, thereby giving Aboriginal people a place at the cabinet table negotiating the 1993 Native Title Act (following upon Mabo v Queensland). If there were no Racial Discrimination Act, that would have been the end of it. Land rights would have been dead, there would never have been a Mabo case in 1992, there would have been no Native Title Act under Prime Minister Keating in 1993. I know no better way to describe the essence of what we do at the WI than by using the mandate Gough Whitlam himself charged us with in 2010, ‘to help the great and continuing work of building a more equal, open, tolerant and independent Australia.’ I would only add to that charge, a more reconciled Australia, to which I’m sure he would agree. Almost all of the multitude of policy achievements – more than any other government in such a timeframe – provide us with a treasure trove of ideas relevant to contemporary politics. My objective is to position the Whitlam Institute to lead courageously on issues of national importance and identity. To raise the flag in acknowledging the complexities around such issues by bringing together the broadest church to respectfully discuss and debate them, with the goal of finding common ground and bringing our nation together. Our policy and research work now focuses on two themes that clearly demonstrate the contemporary relevance of the Whitlam Government – the Future of Australian Democracy and Australia in the World. Under these themes we are working on projects such as Young People and Democracy, Australia’s relations with our neighbours in the Pacific, coherence between Australia’s international positions and its domestic policy, the important place of First Nations people and cultures in modern Australian life, and prospects toward an Australian Head of State and an Australian Bill of Rights. We know these aren’t simple issues, but we believe there is room for better information, broader consultation and positive progress. At the Institute we are passionate about Gough’s Three Great Aims: ‘to promote equality; to involve the people of Australia in the decision- making processes of our land; and to liberate the talents and uplift the horizons of the Australian people’. We are doing this in particular through our non-partisan civics education work. Our focus is primarily on young Australians – our What Matters? Writing Competition and our Primary and Secondary Civics and Citizenship education workshops are intended to uplift the voices of our youth and empower them to be active and constructive citizens of Australia and the world. In fact we are delivering a civics program here in Albury tomorrow. Given Gough’s commitment to equality of opportunity, we currently focus our resources on those more marginalised communities with less access to civic engagement opportunities. Our Institute is located in Western Sydney – a vibrant, growing microcosm of modern Australia and all its opportunities and challenges. Our goal is to bring local issues affecting ordinary Australians into national debates and to bring national policy debates to local people. We believe for policy change to be effective, you need to bring people with you, through engagement and consultation. We use our privileged location in the Female Orphan School – one of Australia’s earliest heritage listed buildings as a place for intellectual and cultural engagement for the people of Western Sydney, and beyond through public events, debates, community engagement, civics education, tours and art exhibitions in our Margaret Whitlam Galleries. The Whitlam Prime Ministerial Collection is an impressive archive of over 35 000 physical and online items, some of which are featured in our permanent exhibition, A Changing Australia: The Time of Gough Whitlam. This Collection provides a comprehensive window for both Australian and international visitors into one of the most fascinating and formative periods of Australian political and cultural history. I would go so far as to say the Whitlam Prime Ministerial Collection is the closest thing Australia has akin to the Presidential Libraries of the United States, such as the JFK Library in Boston. Please do come and visit us sometime. The Whitlam Government and its program demonstrated what was possible, after 23 years of conservative government, by demonstrating enormous courage and making indelible social progress and change. The impact of the Dismissal still rings as the biggest political controversy this country has ever seen. But more than that, many people still say to me that the Whitlam Government changed the face of Australia, forever and for the better. And it is this legacy we honour as we move forward. Bramston, Troy. 2013. The Whitlam Legacy. Sydney: The Federation Press. Corman, Hon Mathias. 2014. "Wind-up of Albury Wodonga Development Corporation." Minister for Finance. November 6. Accessed March 1, 2019. https://www.financeminister.gov.au/media-release/2014/11/06/wind-albury-wodonga-development-corporation. Hocking, Jenny. 2008. Gough Whitlam a Moment in History. Melbourne: Melbourne University publishing Ltd.
Hon Gough Whitlam, Hon Sir Robert Askin, the Hon Rupert Hamer. 1973. "Albury-Wodonga Meeting Joint Communique ." Parliament of Australia. January 25. Accessed February 27, 2019. https://parlinfo.aph.gov.au/parlInfo/download/media/pressrel/HPR10029582a/upload_binary/HPR10029582a.pdf;fileType=application%2Fpdf#search=%22Albury-Wodonga%20Development%20Corporation%22. Pearson, Noel. 2014. "Eulogy for Prime Minister Gough Whitlam - Transcript." Reconciliation South Australia. November 5. Accessed March 1, 2019. http://www.reconciliationsa.org.au/news/reconciliation/read-noel-pearsons-eulogy-for-the-late-former-prime-minister-gough-whitlam. Pennay, Bruce. 2005. Making a City in the Country: The Albury-Wodonga National Growth Centre. Sydney: University of New South Wales Press Ltd.
Uren, Tom. 1973. "Aubrey Wodonga development bill ." Parliament of Australia. November 20. Accessed February 28, 2019. https://parlinfo.aph.gov.au/parlInfo/genpdf/hansard80/hansardr80/1973-11-20/0075/hansard_frag.pdf;fileType=application%2Fpdf. —. 1996. "Full Interview transcript." Australian Biography. January 16. Accessed March 1, 2019. http://australianbiography.gov.au/subjects/uren/interview8.html. —. 1973. "New Cities Program Ministerial Statement." Parliament of Australia. August 23. Accessed March 1, 2019. https://parlinfo.aph.gov.au/parlInfo/genpdf/hansard80/hansardr80/1973-08-23/0045/hansard_frag.pdf;fileType=application%2Fpdf. Whitlam, Gough. 1973. "Speech by the Prime Minister at the signing of the Albury Wodonga area development agreement." Parliament of Australia. October 23. Accessed February 28, 2019. https://parlinfo.aph.gov.au/parlInfo/download/media/pressrel/HPR10030607/upload_binary/HPR10030607.pdf;fileType=application%2Fpdf#search=%22Albury-Wodonga%20Development%20Corporation%22. Whitlam, The Hon Gough. 1972. "ALP Policy Speech It's Time." Parliament of Australia. November 13. Accessed Febriary 27, 2019. https://parlinfo.aph.gov.au/parlInfo/download/library/partypol/1022125/upload_binary/1022125.pdf;fileType=application%2Fpdf#search=%22Albury-Wodonga%20Development%20Corporation%22. —. 1973. "Speech by the Prime Minister, The Hon EG Whitlam to the Land Development Conference of Victoria." Parliament of Australia. February 13. Accessed February 27, 2019. https://parlinfo.aph.gov.au/parlInfo/download/media/pressrel/HPR07000071/upload_binary/HPR07000071.pdf;fileType=application%2Fpdf#search=%22Albury-Wodonga%20Development%20Corporation%22.